Posted September 4th, 2013 by Lisa & filed under blueberries, Quick and Easy, summer desserts, yogurt. I’m excited to share this next recipe with you. Even more excited than usual. Why? Because this past weekend, I got my mojo back. Now, now, it’s not *that* kind of mojo. This is a G-rated baking blog, after all. You probably noticed TRB was quiet for a few months. It wasn’t intentional. I still love baking, blogging and, of course, my fans. I attribute my general malaise to the extreme heat and humidity this summer. It totally put a damper on my (usual) recipe experimentation. 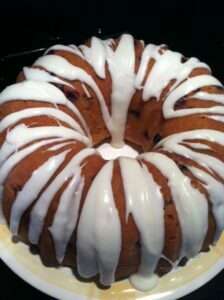 Over the long Labor Day weekend, there I was in my kitchen, watching Food Network, chopping veggies, prepping meals for the week and preparing to bake up this fabulous Blueberry Bundt Cake. Happily, my mojo returned even before that kitchen bliss began. After mastering Crumb Cake, I pondered my next baking adventure. As I thumbed through my new (favorite) souvenir from a trip to California in July — the Ghirardelli Chocolate Cookbook — the wheels started to turn on another challenge (more on that to come! ), but I quickly remembered I still had the latest issue of Food Network magazine to attack. You see, before I lost my mojo, I had read the entire issue and earmarked the recipes I wanted to try — just like I always do. (In fact, I often read each issue three times; once, taking an initial pass through; twice, deciding what I might like to try; and then, finally, folding the corners of those pages containing the most prized recipes. But, because I lost my mojo, I had put my beloved FN in the magazine bin and, well, forgotten about it. After digging it out, I immediately (re)discovered this incredible recipe for the perfect end-of-summer treat: Blueberry Bundt Cake. A few TRB notes about this cake: 1) It’s delicious. It really is. 2) I successfully substituted one 6 oz. container of plain, non-fat Greek yogurt for buttermilk and did not notice the difference. 3) I totally skipped the strawberries. I’m sure they are delicious, but I honestly felt the drizzle icing was enough. 4) I missed the instructions about tossing the blueberries in flour before adding them to the batter. Ooops. Generally, this keeps the berries from sinking to the bottom (in this case, the top) of the cake, but it wasn’t an issue for me. Whew! 5) Apparently, the secret to a super fluffy drizzle icing is a tablespoon of butter. Who knew? Any way you slice it, this cake could help bring your kitchen mojo back. Yeah, baby, yeah! 1. Preheat the oven to 350 degrees. Generously butter a nonstick 12-cup Bundt pan. Whisk 3 cups flour, the baking powder and salt in a medium bowl. Beat 2 sticks butter, the granulated sugar and vegetable oil in a bowl with a mixer on medium-high speed until fluffy, at least 5 minutes, scraping down the sides of the bowl with a rubber spatula as needed. Reduce the mixer speed to low; beat in the eggs one at a time, then beat in the vanilla. Add about one-third of the flour mixture and half of the buttermilk; beat until almost incorporated. Add another one-third of the flour mixture and the remaining buttermilk. Beat, scraping down the sides of the bowl as needed, until just combined. Add the remaining flour mixture and beat 30 seconds. Finish incorporating the flour by hand to avoid overmixing. 2. Toss the blueberries with the remaining 2 tablespoons flour in a small bowl. Spoon one-third of the batter evenly into the prepared pan. 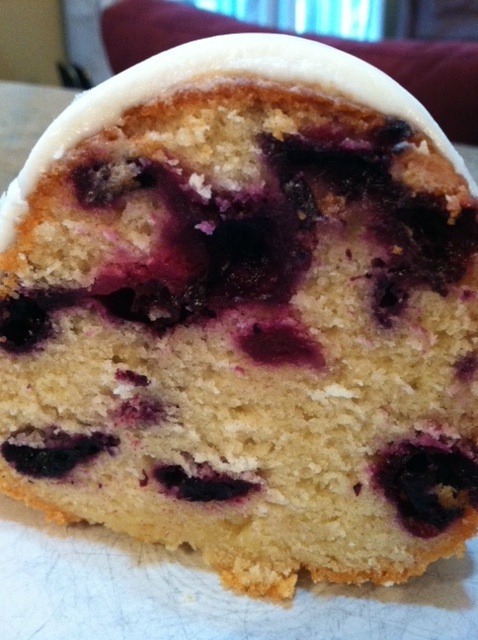 Sprinkle in half of the blueberries, then top with another one-third of the batter. Scatter the remaining blueberries on top and cover with the rest of the batter; smooth the top. Bake until the cake is golden brown and a toothpick inserted into the center comes out clean, 1 hour to 1 hour, 10 minutes. Transfer to a rack and let cool 30 minutes in the pan. Run a small sharp knife around the edge of the pan to loosen the cake, then invert onto the rack to cool completely. 3. Just before serving, make the glaze: Whisk the confectioners’ sugar, butter and 4 tablespoons milk in a bowl; if the glaze is too thick, whisk in up to 1 more tablespoon milk, a little at a time. Pour the glaze over the cake, letting it drip down the sides. Did you try this recipe? Tell us what you think! Post a comment below.